The Outcasts are a neutral band of misfits made of up of an assortment of alien species. They generally avoid contact with other factions but can be befriended through diplomacy. "The Outcasts is a loose organization comprised of many different alien species. The harshness of space has left these people without a home, and so they rely on each to survive. The Outcasts are not particularly strong, but treat outsiders with justifiable wariness. The Outcasts are spread thin across the stars and seek to avoid the attention of others." 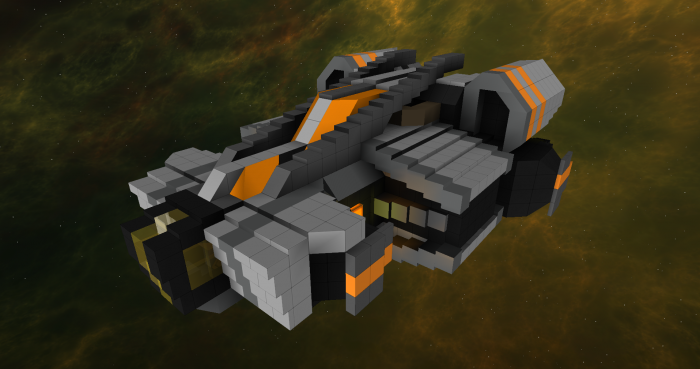 The Blight Class Bomber is a standardized military vessel for the Outcast. The ship is fairly straight-forward and reflects larger military ships in it's design. The ship has seating for a pilot and the bomber. Inner Ship Remote"no data" Toggles the Engine lights on and off. (Location: 16,5,27) Located underneath the vessel. 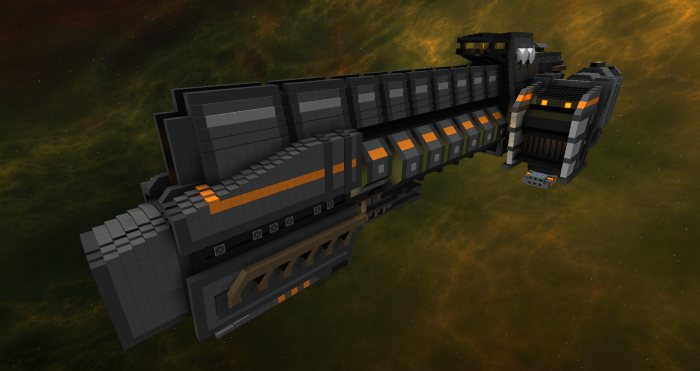 Despite it's size, the ship employs the use of two turrets along with a hard mounted cannon. 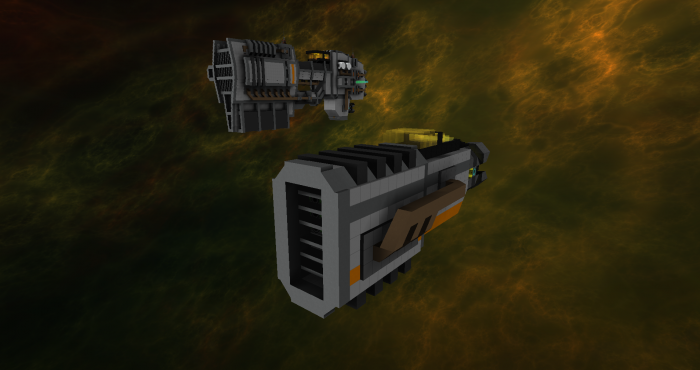 While it may not have the defensive capability of a Trading Guild patrol ship, the two can still go toe to toe with one another. This version improves upon the original design in many ways. Many of the external components have now been seated behind armor panels. The entire ship performs better. The cockpit was moved to the rear to avoid being directly in the line of fire from oncoming attacks. Inner Ship Remote"Engine" Toggles the Engine lights on and off. (Location: 19,15,28) Located on the under side of the vessel. Docked on the left and right side of the vessel. The design of the Outcast's dedicated exploration vessel is unusual. The vessel comes with no offensive capabilities, and minor defenses. Instead it relies on it's massive engines to get it out of trouble in a pinch. It also employs the use of a large sensor array, which comprises most of the bow. If needed, it can also activate it's anti gravity generator located in the stern, to combat the effects of gravity wells. 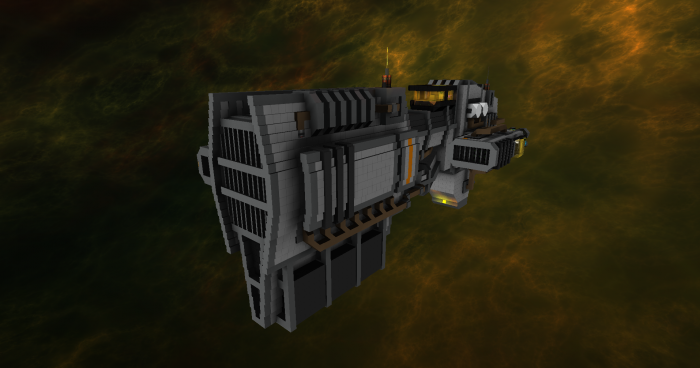 Underneath the ship is room for a detachable Pioneer Pod and the lower hull serves as a cargo bay for any salvage one may bring in. (Location: 16,8,31) Located underneath the vessel. 1 x Rail Elevator Elevator that connects the gangplank bottom to the command deck. The Outcast's are first and foremost, scavengers. Not the dangerous pirate-y kind. They do not have a massive established economic empire such as the Trading Guild. As such, they often explore the wrecks of derelict ships and stations throughout the region. This exploration pod allows them to get into the tighter spaces of these vessels. 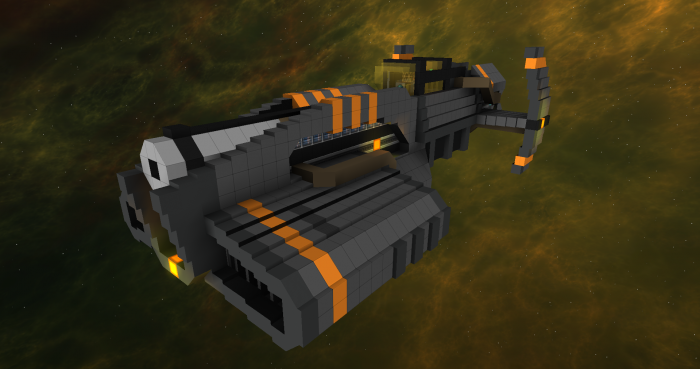 The Prospect is the premiere mining vessel for the Outcasts. The ship fields an impressive salvager, considering it's size. In addition, there is also supplementary systems to aid in salvage and mining operations. (Location: 6,4,15) Part of a USD dock on the vessel's right side. The Scud is a robust thing. Despite it's sturdy design, it is quite mediocre as far as shuttles go. It contains only two passenger seats and minimal cargo capacity. Still, many fit additional equipment in it's limited interior as they see fit. Inner Ship Remote"Engines" Toggles the Engine lights on and off. (Location: 16,13,19) Located on the under side of the vessel. 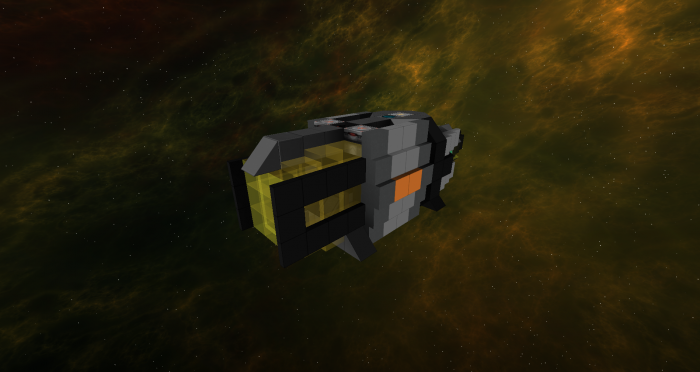 The Spade is a one-man mining pod capable of docking to the Prospect. This vessel makes appearances on other large mining barges, but is generally accepted as a supplement to the Prospect only. If needed, a rudimentary AI system can be activated if the pilot is absent. Here we see a prime example of Outcast Engineering. Many Outcast vessels make use of angled hulls. 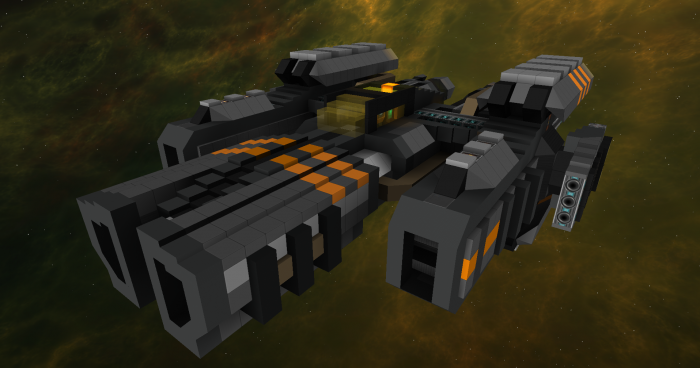 These ships are robust yet plain, and in some cases more utilitarian than the Trading Guild ships. While the Outcasts do not exactly piece their ships together as much as the Scavenger pirates do, there are still elements of randomness. Over time the design of the ship was modified, but the hull remained the same. As a result, many newer components of the latest versions are attached to the exterior. 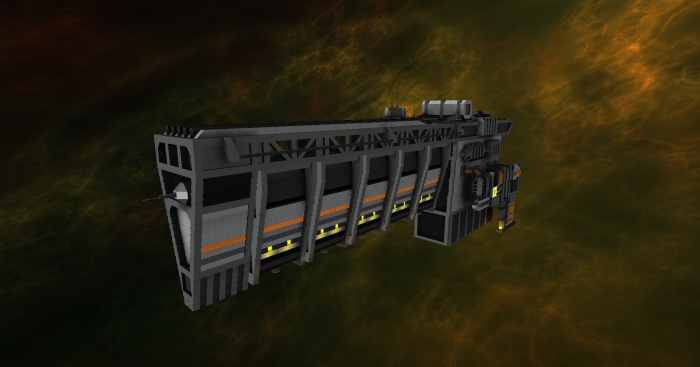 The freighter itself does not support as much cargo as the TG counterpart. Instead it boasts impressive thruster systems, and makes for a good blockade runner. (Location: 32,14,93) Part of a USD dock on the vessel's front. The Ward serves as both a transport, and as a military vessel. The vessel was once solely a transport ship, intended to ferry citizens across space. 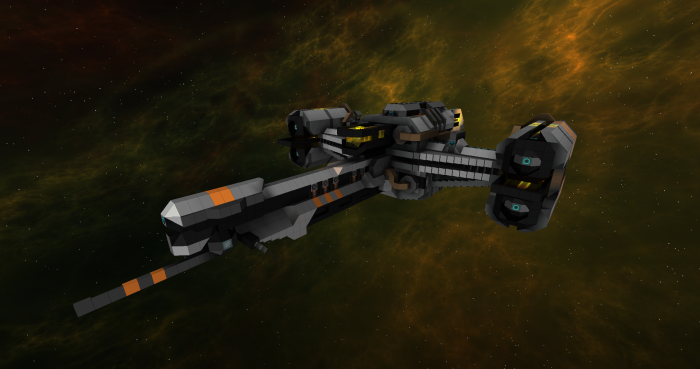 Due to the dangers of space, the vessel now comes equipped with multiple weapon systems. It is the first ship in the Outcast lineup to be manufactured en-masse at major shipyards. Inner Ship Remote"[no data]" Toggles the Engine lights on and off. 1 x Rail Elevator Connects the bottom section to the top. This page was last edited on 12 March 2017, at 11:01.